Long gone are the days of boring men's fashion at glitzy awards ceremonies. Banished are plain black and white suits and patent leather dress shoes. As "embellished bibs" and velvet tuxedo jackets in all colours of the chic rainbow become the norm, it's open season for men's fashion - and it's becoming incredibly exciting. Here are the men's fashion lessons we learned from some of our favourite, most sartorially savvy stars on the red carpet, just in time for that ritzy Valentine's Day dinner date you have planned. Hear us out. While once the accessory of choice for Pavarotti, the cummerbund has a long history as a fashion accessory, originating in ancient Persia before being adopted by the British military in India. Traditionally a pleated sash, the piece is worn around the waist, with pleats facing up and under a tux jacket. The sash has appeared on red carpets here and there, but something about Chiwetel Ejiofor's Giorgio Armani version - paired with a matching navy bow tie and elegant tuxedo - looked extremely wearable and suggested it might become a common sight once again. White tuxedo jackets have been sported on the red carpet for many, many years but it's rare to see someone fully pull off an inverted tux - that is, a white suit with black shirt and tie. Leave it to Rami Malek, the star of Bohemian Rhapsody and possible host body to Freddie Mercury's spirit, to carry off the look with aplomb, his crisp white suit popping against the flat black of his shirt and looking extremely fresh and modern. It also helps that his main accessory was a BAFTA. Valentino Garavani has probably dressed more stars for the red carpet than you've had hot dinners, so it's unsurprising that the man behind one of the most exclusive fashion houses would put in a tour de force showing at the BAFTAs ceremony. Valentino gave us a masterclass in layering for the fashionable man about town, as well as in textural dressing, pairing his shimmery waistcoat with a plush velvet tuxedo jacket and topped with a chic wool coat. The combination made for a snug and sophisticated outfit that managed to look refined rather than lumpy. Also, a moment of appreciation for his bow-embellished dress shoes, please. What can be said about Timothée Chalamet's fashion sense that hasn't been said before? 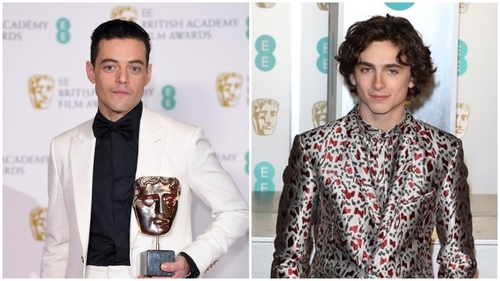 Since the young actor rose to fame last year, he has consistently impressed on the red carpet, championing the weird, the unexpected and the frankly perplexing, and pulling each look off flawlessly. Last night was no exception, as Chalamet walked the red carpet in a design by Haider Ackermann, one of the star's favourite designers whose fiercely modern reinterpretations of men's fashion have gained him a cult-like following. The loud white and red pattern could have turned out garish, but instead the shirt and jacket melts into one another, creating a chic and interesting look.